The Greek revolt against Turkish rule in the 1820s, and the ensuing establishment of an independent Hellenic Kingdom, was the principal precursor of an age of nationalism in the eastern Mediterranean world. Amongst the Great Powers, Great Britain thereafter played the most critical role in struggles to expand the frontiers of Greece beyond their initially confined extent. Through a focus on events leading to the cession of the Ionian Islands to Greece in 1864, theoften bloody process of Cretan unification climaxing in 1913, the adhesion of the Dodecanese to Greece in 1948, and the travails of British colonial rule in Cyprus through to independence in 1960, the book develops a comparative overview of Great Britain's engagements with the modern Hellenicexperience. At the heart of the various themes covered by this volume is the interaction between internal and external forces shaping the futures of divided island societies. In exploring the resulting patterns the authors provide an original insight into the political and social morphology of the eastern Mediterranean. Although the principal context is provided by Anglo-Hellenic relations, the nature of the struggles necessitate a close attention to Ottoman decline and post-Ottoman succession, Great Powerrivalries, ethnic and communal disintegration, the early history of international peace-keeping, and decolonization after 1945. In tracing these preoccupations, the often neglected significance of the eastern Mediterranean is more accurately situated in relation to British authority overseas and its limits. Although the policy process is carefully charted, the essential concern is with struggles of mastery within islands where Britons and Greeks, amongst others, found themselves frequently at odds. 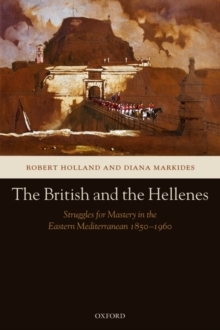 In evoking the engagement between British power and Hellenic nationalism, a fresh perspective is given to the modernhistory of the eastern Mediterranean, and the Balkan and Near Eastern worlds to which they were intimately connected.